We are an interdisciplinary group of five women artists collaborating on site-specific projects since November, 2003, examining a deep relationship to place, exchange and each other. 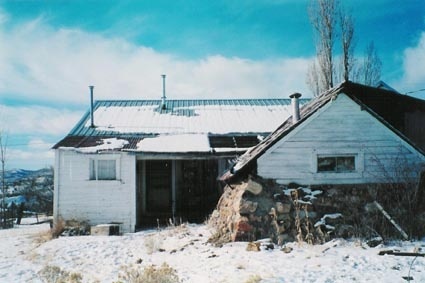 ‘The Beauties’ arrived in the tiny (Pop.13) historic mining town of Tuscarora, Nevada in snowstorm on the week before Thanksgiving in 2003. Those ten days of group residency and field-work at dawn changed all of our lives. Our follow-up exhibition: ‘EXPEDITION’, installed at JFKU in 2004, included drawings, photos, samples of our clay work, and video stills of sites along the way, including the fantastical taxidermy museum of Elko, NV. The B Club’s second residency was in the haunted waterfront ‘Bordello’ hotel of another tiny historical town: Port Costa, CA. Once a thriving shipping and railroad center on the bay delta, Port Costa today has a small population and is surrounded by wind swept parklands east of San Francisco. The famous Burlington Bordello was actually a high-end residency hotel for railroad magnates, and in later, less affluent times, drug addicts. The B Club’s most recent project is titled ‘Pollination’. Pollination is a mail exchange. One artist sent an edition to each other group member. Only one responds to the rest of the group and so it goes, throughout the sequence, artist to group. We are currently awaiting the final edition for ’Hive 2’ of this mail exchange.